As we reported earlier, BSNL - one of India's largest Public Sector Units has decided to recruit 2510 Graduate Engineers for the post of Junior Telecom Officer (JTO). The PSU will be selecting candidates having a valid Gate Score 2017. Now, the PSU has released circle wise break up of 2510 vacancies to be filled up by the proposed JTO Recruitment drive. Maximum vacancies are available in Maharashtra telecom circle (440 vacancies) followed by Kerala (330 vacancies) and Karnataka (300 vacancies). 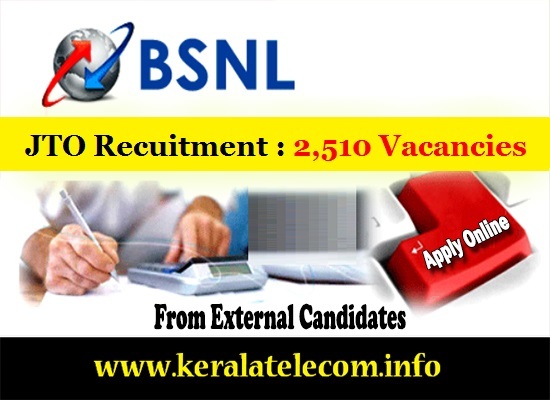 However, BSNL will not be recruiting JTOs from Andhra Pradesh, Haryana, Rajasthan, Uttar Pradesh (East), Madhya Pradesh and Kolkata Telecom District since the vacancies available in these circles are Zero. Category wise break up of vacancies viz. OC, SC, ST, OBC will be calculated by respective telecom circles soon. BSNL corporate office has directed telecom circles to calculate the number of posts reserved for Person With Disabilities (PWD) candidates in their respective circle also. BSNL will be offering IDA pay scale of Rs 16400-40500 (E1 Scale) with annual increment of 3 percent of basic pay plus IDA, HRA, Perks, Medical Benefits etc admissible as per company rules. The Candidates having qualification BE / B.Tech or equivalent in Telecom / Electronics / Radio / Computer / Electrical / Information Technology / Instrumentation Engg. or M.Sc (Electronics) / M.Sc (Computer Science) are required to appear GATE exam 2017, opting one paper from selected four disciplines of GATE paper codes i.e., CS & IT/ EC/ EE / & IN. Details are available at www.gate.iitr.ernet.in/. Registration process will start with effect from 1st January 2017 to 31st January 2017 through online BSNL portal. For details, candidates may log on to www.externalexam.bsnl.co.in from 1st December 2016. Dear readers, please share your views and opinions about this latest Recruitment Drive announced by BSNL via comments with us.